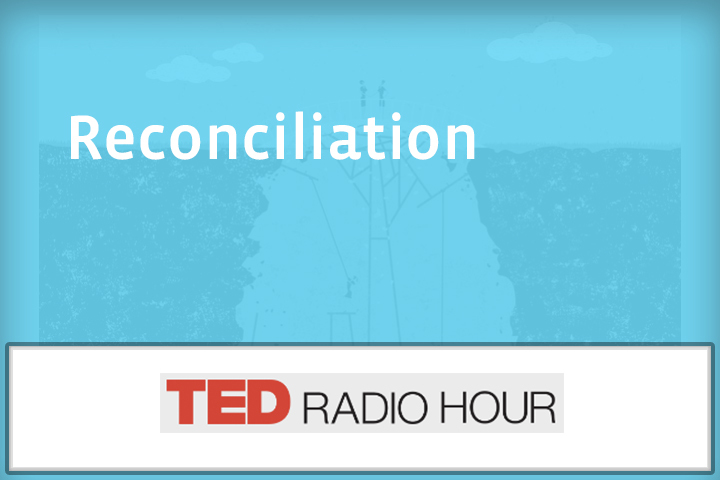 It’s the TED Radio Hour from NPR. I’m Guy Raz. So are you feeling as anxious as I am about just how divided the world and our country is right now? UNIDENTIFIED MAN #1: If they’re illegal, go back. If they’re illegal, go back. UNIDENTIFIED WOMAN #1: Go back. UNIDENTIFIED WOMAN #2: I see too much of the people coming across and immediately taking welfare and food stamps. UNIDENTIFIED MAN #2: They’re mad because they’re no longer in the majority. They’re mad because they no longer see themselves as the ones in power. MARK ALDERMAN: It is shameful to say that the president of the United States encouraged illegal voting. RAZ: …It feels like it’s getting harder to exchange ideas with people who disagree. UNIDENTIFIED MAN #3: One person’s fake news is another person’s news. RAZ: Especially when we can’t even agree on a common set of facts. ALISYN CAMEROTA: Violent crime is down. The economy is ticking up. NEWT GINGRICH: It is not down in the biggest cities. CAMEROTA: Violent crime, murder rate is down – national FBI facts, statistics. RAZ: …When it seems harder than ever to meet in the middle, when there’s so much conflict? BILL URY: Well, I think conflict is a good thing. I mean, conflict is part of life. It’s how things get done. Democracy is conflict. RAZ: Bill Ury – he might just be the guy we need right now. He’s a mediator. URY: To me, the real question is not whether to get rid of conflict or not. It’s whether we can transform destructive forms of conflict to constructive forms of conflict like dialogue, like democracy, like cooperation. RAZ: Bill has been involved as a negotiator for hire. So given all that stuff you’ve done, when you look at where we are now in this place and time with all the division that we are experiencing, is this the worst moment ever in your experience? URY: We’re in the most intense moment, but I don’t think we’re at the most dangerous moment. The most dangerous moment, I believe, was during the Cold War when at any moment someone in the Kremlin or the White House could decide today is the day or there could be a crisis like the Cuban Missile Crisis, and you’d put all of life on this planet at risk. So, yes, conflict seems to be at an all time high, but it is not the most dangerous moment. And so it’s messy, but it’s an opportunity for us to devise new forms of democratic participation, new forms of negotiation, new forms of conflict resolution. So it’s a – it’s an enormously creative moment as well. RAZ: So for everyone who’s a bit conflicted about these times we’re living in, we’re going to seek some reconciliation on the show today and hear ideas about coming together, how we can do it even when it feels impossible. So if this truly is a moment to reconcile, as Bill Ury suggests, where do we even start? URY: I’ve been asking myself that question. RAZ: Here’s Bill on the TED stage. URY: And I think I’ve found in some ways what is the secret to peace. It’s not easy, but it’s simple. It’s not even new. It’s maybe our – one of our most ancient human heritages. The secret to peace is us. It’s us who act as a surrounding community around any conflict who can play a constructive role. Because if you think about it, normally when we think of conflict when we describe it, there’s always two sides. You know, it’s Arabs versus Israelis, labor versus management, husband versus wife, Republicans versus Democrats, but what we don’t often see is that there’s always a third side. And the third side of the conflict is us. It’s the surrounding community. It’s the friends, the allies the family members, the neighbors. And we can play an incredibly constructive role. And everyone can play that role if you care about – not just about winning your point, but you care about the whole. You care about the community. You care about the longer-term relationships. You care about the strength of our democracy. Then you’re a third sider. You care about the whole. RAZ: But how do you actually resolve conflict when people on both sides feel like they are the ones you care about the whole? URY: Well, what you do is you listen behind the positions. You know, people were taking positions on immigration – I want it to stop and build a wall – that’s a position. You know, I want to allow immigration – that’s a position. To understand what are the underlying interests, in other words what are the underlying fears or concerns? So you’d hear, well, I’m concerned that I might lose a job if someone else takes my job. I’m concerned about safety. And then you say, OK, how can we address those underlying concerns? Then we’re on – both on the same side of the table facing the problem. We’re attacking the problem jointly, rather than attacking each other. And that’s the key is that reframe from adversarial confrontation to side-by-side hardheaded joint problem-solving. URY: When we’re involved in conflict, it’s very easy to lose perspective. The third side reminds us that. The third side helps us go to the balcony which is a metaphor for a place of perspective where we can keep our eyes on the prize. Let me tell you a little story from my own negotiating experience. Some years ago, I was involved as a facilitator in some very tough talks between the leaders of Russia and the leaders of Chechnya. There was a war going on, as you know. And the talks got off to a rather rocky start when the vice president of Chechnya began by pointing at the Russians and said you should stay right here in your seats because you’re going to be on trial for war crimes. And then he went on, and he turned to me and said you’re an American. Look at what you Americans are doing in Puerto Rico. And my mind started racing. Puerto Rico? What do I know about Puerto Rico? I started reacting. But then I tried to remember to go to the balcony. And then when he paused and everyone looked at me for a response, from a balcony perspective, I was able to thank him for his remarks and say I appreciate your criticism of my country. And I take it as a sign that we’re among friends and can speak candidly to one another. And what we’re here to do is not to talk about Puerto Rico or the past. We’re here to do – just see if we can figure out a way to stop the suffering and the bloodshed in Chechnya. The conversation got back on track. That’s the role of the third side is to help the parties go to the balcony. RAZ: It seems to me like a big source of conflict is human ego. Is that fair? URY: It is fair. Human ego is basically defensiveness against being threatened. RAZ: This is the crazy thing about our human species, that peace is harder than war, that we have evolved to a place – or maybe we were always like this, maybe it was just wired into us – that war and fighting is just easier. It’s just an easier default than actually resolving something. URY: It is. It’s true. Peace is harder than war. And the fact that we’re still all alive here is because our ancestors got good at this because we have this birthright of the third side of the community coming in and saying we can find a way through this. And, I mean, human beings were hardwired for cooperation. That’s why we have language. That’s how we’re able to speak is because we learn to cooperate in order to deal with our differences. So, yes, it’s hard, but we’re also given the tools of being able to communicate with each other, being able to listen to each other that allow us to work through these differences. RAZ: You know, Bill, when I’m looking around at what’s happening after the election in the U.S. or, you know, elections abroad or conflicts, it seems like most people’s values are being deeply challenged, you know, and it’s making people less willing to reconcile. URY: This is hard stuff, Guy. URY: All I can say is having traveled the world, been in the most difficult conflicts around the planet for the last 40 years, I’ve seen nothing yet that persuades me that it’s not possible for human beings to do this work. So many conflicts right now are between people feeling excluded. You know, people were feeling excluded from the process of globalization, excluded from the modern economy. The whole challenge now is how do we include? How do we even include those who would exclude? That’s the challenge, but it’s possible. RAZ: Bill Ury – he’s the co-author of “Getting To Yes.” Watch his full talk at ted.com.